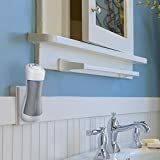 Interested in the GermGuardian GG1000 Small Air Purifier, Pluggable UVC Air Sanitizer, Room Deodorizer, Kills Germs, Freshens Air, Reduces Odors from Pets, Mold, Smoking, Cooking, Laundry, Germ Guardian Air Purifier? Is the price too high? You can easily price watch this product and we'll notify you when the price reaches your target.